CRC for Construction Innovation has produced a document reviewing the achievements of the research centre from 2001 to 2008. The brochure brings together information from the major research areas supported by Construction Innovation: Sustainability, Safety, Digital Modelling, Infrastructure, Procurement and Skilling, tools and outreach. Key projects from each of these areas are documented, including the award winning Your Building, LCADesign, Safer Construction, Sydney Opera House Exemplar and BRITE projects. The brochure is an important document both as a record of the achievements and as a starting point to discover more about the valuable research completed during the lifetime of the CRC. 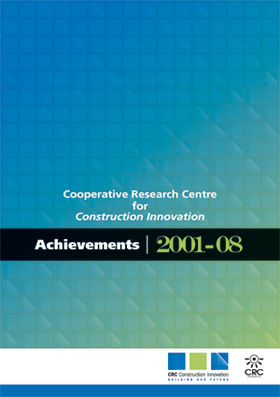 In accordance with the commonwealth funding structure for Cooperative Research Centres, Construction Innovation is due to cease operations on 31 June 2009. A proposed Sustainable Built Environment centre offers an exciting opportunity to continue the momentum created by the Cooperative Research Centre (CRC) for Construction Innovation, with a new research and education portfolio geared to emerging industry priorities across key areas of environmental, social and economic sustainability commencing 1 July 2009.